Beetroot puttu is a quick side dish for your lunch. In my blog, I have already posted plantain puttu and potato puttu which can be prepared easily without much work. 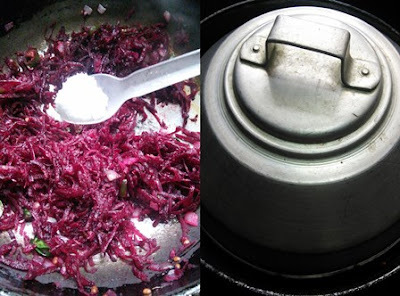 This beetroot puttu is also similar and there is no need for precooking as done for plantain and potatoes. Anyone can prepare this easy dish for your family. 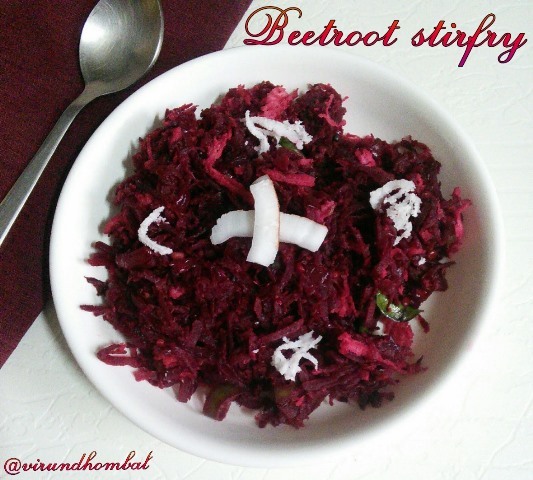 For this dish also I suggest to use fresh beetroots which can be easily grated and gets cooked within few minutes. If you use 4 days old refrigerated beetroots it is difficult for grating and the taste is also not good. 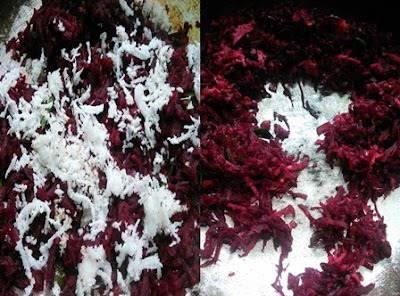 This beetroot puttu is a perfect side dish for sambar, rasam and pulikuzhambu. The leftover puttu can be used to prepare beetroot utthapam. Now let's see how to prepare this beetroot puttu. Beetroot puttu is a quick side dish for your lunch.This beetroot puttu is a perfect side dish for sambar, rasam and pulikuzhambu. Peel and grate the beetroots evenly. Heat oil in a kadai and add the mustard and urid dal. 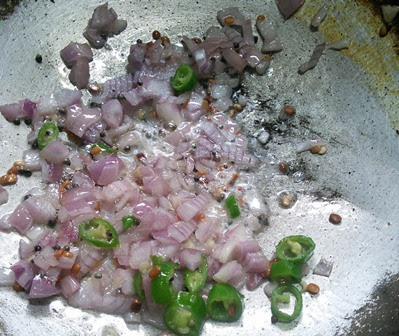 When it splutters, add the green chillies and onions. Then add the curry leaves and the grated beetroots. Mix them well and continue to saute. Add the required salt. Close it with a lid for 2 minutes. After 2 minutes, sprinkle the grated coconuts. Mix them well and cook until all the moisture in the dish evaporates. 1. Wash the beetroots. Slice off the top and the bottom. Peel the skin gently. Take a grater and hold the grater with your left hand. Apply less pressure and grate the beetroot up and down. 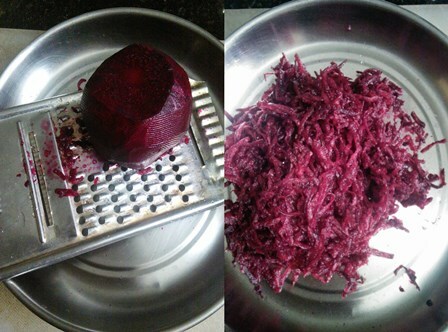 If you can't able to hold the beetroot, then cut them half and grate them. 2. Heat oil in a kadai and add the mustard and urid dal. When it splutters, add the green chillies and onions. Saute them well until it turns golden brown. 3. Then add the curry leaves and the grated beetroots. Mix them well and continue to saute. Add the required salt. Close it with a lid for 2 minutes. No need to add any water. If you try this recipe for Beetroot stir fry/puttu send us your comments below and share the recipe for your friends and family.